Don’t count the Miami Hurricanes out. In the midst of the nation’s second-longest win streak – eight consecutive victories – in Division I college baseball, the program that won the College World Series in 1982, 1985, 1999 and 2001 still hopes to qualify for the NCAA tournament. 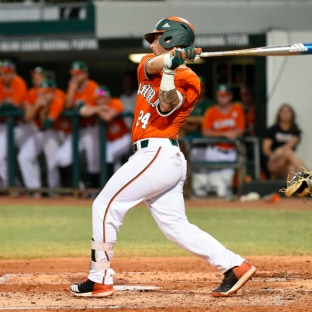 UM will usher out the Jim Morris era Thursday through Saturday in the final home series of Morris’ 25-season coaching tenure in Coral Gables, with Saturday’s tickets selling for $3 apiece (Morris is nicknamed “3” for his No. 3 jersey) to draw a full house. The opponent: Atlantic Coast Conference cellar-dwelling Boston College, at 17-30 overall and 7-20 in the conference, by far the worst team in the league. It took the Hurricanes (25-25, 14-13 ACC) this long to get to .500. But to achieve their goal of an at-large bid in the 64-team NCAA tournament and avoid the unthinkable – missing the postseason two years in a row after a national-record streak of 44 NCAA berths – the Canes must sweep the Eagles and likely must at least get into the ACC tournament championship game. The only automatic way for UM to qualify for the NCAA tourney would be by winning the ACC tournament that begins Tuesday and runs through May 27 at Durham Bulls Athletic Park in North Carolina. But short of that, the Canes must win all three against BC, which would give them an 11-game win streak heading into the ACC tournament, and put the Canes over .500, required by the 10-member NCAA Division I Baseball Committee to even be considered for the postseason. UM’s current RPI: 59, which isn’t strong enough for the Canes to feel secure about an at-large bid. In 2017, the Canes were 4-4 in their last eight games heading into the final home series against Virginia Tech. They swept that series to go 29-26 in the regular season, then went 2-1 in the ACC tournament for a 31-27 record. But it wasn’t enough to propel them to the national tournament. The Canes could have helped themselves a great deal had Tuesday night’s game against Stetson (40-11), which has a No. 7 RPI of 300 Division I college baseball teams, not been canceled in the bottom of the fifth because of rain and lightning. Stetson’s win streak currently leads the nation at 10 games, and the score was 1-1. This article is written by Susan Miller Degnan from Miami Herald and was legally licensed via the Tribune Content Agency through the NewsCred publisher network. Please direct all licensing questions to legal@newscred.com.